This Super-Multi-Coated version of the 135mm f/3.5 lens from Asahi Optical Co. Ltd. is a 42mm screw thread lens intended for use on the Pentax Spotmatic cameras. Optically it is the same as the Super Takumar Model II that preceded it. This newer version, made from 1971-1975, has the new SMC 7-layer coating, plus the mechanical meter coupling for the Spotmatic F body. This means that, with the right camera, metering can be measured at open aperture without having to stop the lens down to the working aperture. This is no longer supported so stop-down metering needs to be used with the K-1. We also need the Pentax Adapter K to enable the screw thread lens to be used on the bayonet fit camera body. The correct technique is to fit the adapter to the lens and then bayonet onto the body. Screw thread lenses can then be removed and fitted as the camera has in effect been converted temporarily into a screw thread body. As the adapter is flush with the mount there is no problem with infinity focus. Users of modern lenses may be quite surprised at how slim these lenses are. All metal and glass, although at 340g it feels solid enough. It also looks extremely well made, with high-class engraving and super-smooth operation of the large focusing ring. 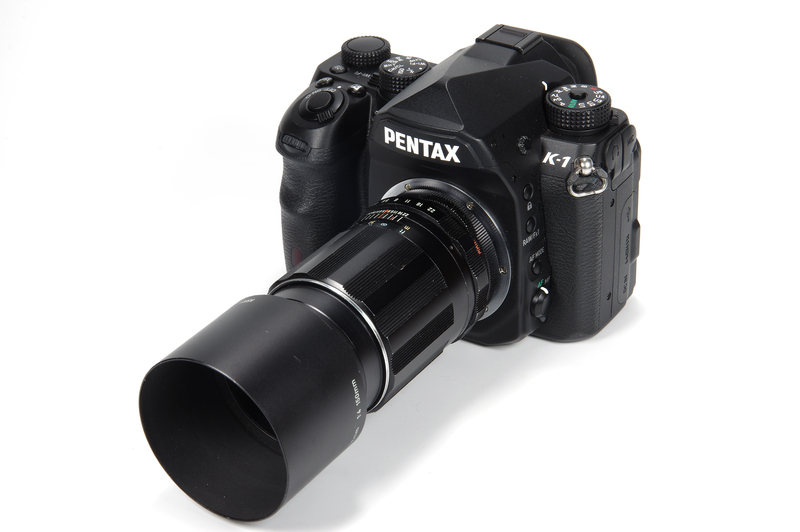 There is a 49mm filter thread and a dedicated screw-in lens hood that is used for this lens and also for the 150mm f/4. The hood is, of course, metal. The focusing is so gorgeously smooth that operating it is a tactile pleasure that needs to be experienced. A cut out reveals the focus scale, marked clearly in feet and metres. 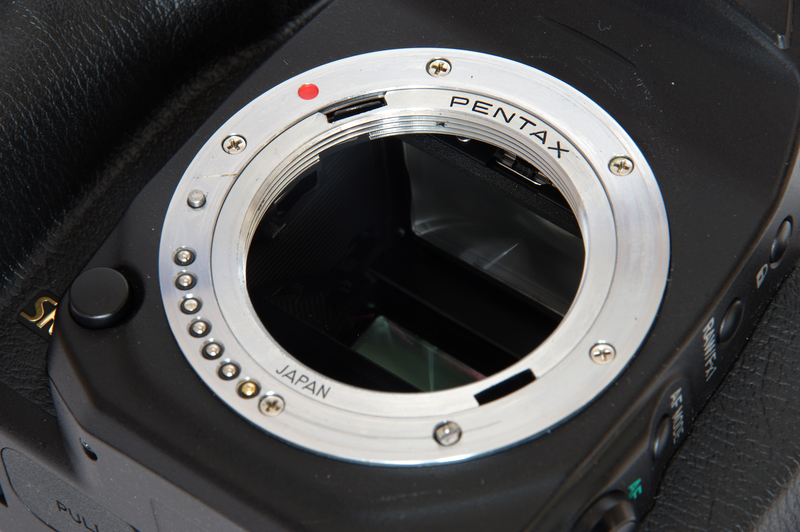 There is also a meaningful depth of field scale, plus an extra red line that indicates the infra-red focusing position. If using IR film the user would focus and then shift the focusing ring to the IR mark. Lenses were not corrected to focus IR light and visible light at the same point. Focusing at open aperture, for best results Live View is the most effective method. The focusing screens on AF DSLRs do not have any of the traditional focusing aids such as microprism spots or split image rangefinder spots and so can be quite difficult to use for manual focusing, but a magnified Live View image does the trick. After focusing, the lens needs to be stopped down to the working aperture. Av and M modes will allow metering. The aperture ring has half stop indents and is smooth in operation, running from f/3.5 to f/16 and then a full stop to f/22. Behind this is the Auto/Manual switch which selects open aperture and closed down aperture. This is very useful for DSLR metering as set to Auto the diaphragm opens to maximum aperture and focusing is easier. The beep of the K-1 focus confirmation is an added guide to getting the focus spot on. For this to work, the camera should be set to AF. When we are ready to shoot the image moving the lever to Manual will stop the lens down to whatever value we have selected. The alternative technique is to leave the switch on Manual and just use the aperture ring to open the lens up, then count down the steps to set whatever working aperture is desired. It should be noted that some A/M levers will only work when the lens is mounted on the camera, so one that is solidly fixed may not indicate a fault. Optical construction is 4 elements in 4 groups, a classic configuration for a lens of this specification. Focusing is down to 1.5m or 5 feet, which is not really anywhere near as close as we have become used to. Nonetheless, it is much better than the 13 feet minimum focus of some 1950s SLR lenses. In use, the 135mm could be considered a little too long for some photographers, but it does have good reach and on an APS-C crop sensor camera would have a “35mm format equivalent” field of view of a 200mm lens. On full frame, it is particularly useful for tight portraits, architecture, close sports and landscape. Please login here or if you've not registered, you can register here. Registering is safe, quick and free.